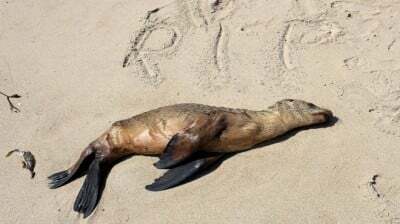 Ten Thousand Dead Sea Lions Wash Up In California, “This is A Crisis”. What is the Cause? The report below has identified “the crisis”. The media reports do not not indicate the cause of this loss in marine mammal life. This year is the worst yet… more than 1,600 marine mammals have been picked up. No discussion of causality: The unspoken question: Is it related to Fukushima radiation as suggested by several earlier reports? NBC L.A., Mar 12, 2015 (emphasis added): “The sea lion emergency is back all along the California shore“… [Pups] are washing ashore at a rate so alarming, rescuers said Thursday, this year is the worst yet… more than 1,600 marine mammals [have been picked up]. KTLA, Mar 10, 2015: Stranding numbers for the months of January and February were more than 20 times the average [said NOAA]. ABC 10 News, Mar 14, 2015: Friday, Konnie Martinkis was burying her third sea lion… There were at least five within just more than a football field’s length that were dead… she contacted the city… but it just decomposed as more showed up… she will continue building those graves. Coast News, Mar 12, 2015: [NOAA] said not to feed it [that] will only prolong the animals suffering. NY Times, Mar 12, 2015: “It’s getting crazy,” [Wendy Leeds, animal-care expert at the Pacific Marine Mammal Center] said… Sharon Melin, a wildlife biologist with [NOAA said] “We do expect the population to take a drop… probably a really good hit”… Michele Hunter, the center’s director of animal care, said, “It’s very difficult to see so much death. Sacramento Bee, Mar 7, 2015: Tens of thousands of pups birthed last summer are believed to be dying on the islands… some [are] desperately trying to climb onto small boats or kayaks… Scientists noted a worrisome anomaly in 2013, when 1,171 famished pups were stranded… scientists blamed the phenomenon on unseasonably cold waters… On San Miguel… Melin said researchers believe “probably close to 10,000 are dead, and we expect more to die over coming months”… the mortality rate is similar on San Nicolas. Time: Experts at NOAA say that the culprit is rising ocean temperatures [note “unseasonably cold” ocean temps were the culprit during the record strandings in 2013]… a NOAA climate expert said that they do not believe the stranding increase is tied to climate change. LA Daily News, Mar 13, 2015: “By the end of January, we had as many as we did in (all of) 2013,” [Marine Mammal Care Center’s David Bard] said… “We’ve never seen anything like thiswith back-to-back events that are affecting the same part of the population,” Melin said.